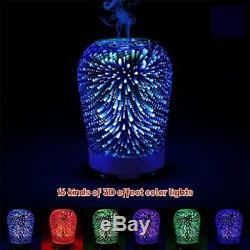 16 Color Changing Starburst LED Essential Oil Diffuser Ultrasonic Cool Mist 3D. Mikiya Store proudly present this item to you. New Great Gift - Portable for yoga, gym, office, baby room or bedroom. Perfect gift for family and friends who love aromatherapy or can benefit from aromatherapy healing. Versatility- Unique 3D effect(Flat Round Shape) with the automatic 16 color changes, calmly and softly changing from one color to the next;Long press automatic to turn off the lights;operated manually with simple two button control. Once the water runs out, it wil be auto shut-off to protect the device. Ultrasonic Quiet - Our diffuser has quiet ultrasonic qualities. Its soft hum allows you to have a peaceful aromatic experience each time, especially for use in a nursery or workspace. Soothing & Relaxing- The Ultrasonic Oil Diffuser utilizes non-heat ultrasonic waves and the natural healing properties of the oils. The Ultrasonic Aromatherapy Oil Diffuser emits a steady mist of soothing soft swirls, filling the air with your desired essential oil. Can also be used without oil as a humidifier. 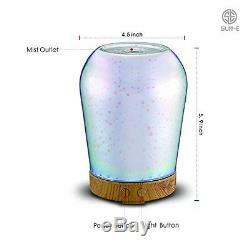 Safe For Children - With CE, FCC, RoHS Safety Approval, this diffuser is safe for children. It can purify the air, eliminate bacteria and reduce dust levels wherever it is used! Our item is a great choice for you. New Contraption This aromatherapy oil diffuser will surely catch everyone's eye! Get this humidifier from our newest collection! 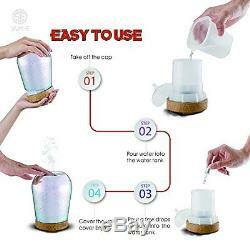 Specification: Product Name: Ultrasonic Aroma Diffuser -Brand: SUN-E -Material: Glass cover, and PP -Dimension: 3.65.9 inches -Tank Capacity: 100ML -Operating time: Spray volume 4 hours ± 1 hour -Input Voltage: 100-240V -Output Voltage: DC 24V -Power: 12W -Vibration frequency: 3MHz 3 megahertz. 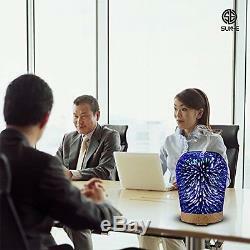 3 million times /s Internationally, the radio frequency is defined as a high frequency by Telecommunication Union (HF): 3-30 megahertz (MHZ) -Ultrasonic Frequency: 2.4MHz -LED Number: Six full-color LED lights with 16 gradient colors 16 Color changing mood lighs: SUN-E Ultrasonic Aromatherapy Oil Diffuser is a well designed with 3D 16 Color Changing LED lights, easy to operate and portable, so you can take it anywhere you want. Perfect for you bedroom, office or any area of your work or home, the perfect elegant way to health even a great gift! Add humidity to your air and use your favorite essential oil for health benefits. It's has an Aroma mist and give the fresh air and relaxation mist. Quiet Running: Most diffusers are really noisy. This one is really quiet. You will likely forget you have it on. Which is why the automatic shut off is a nice feature with this. It is so silent the only way you may know it is on is if you have the lights or the mister going. You will not be disappointed with this diffuser. Safe & Easy to use - Very easy to use; featuring a one-button-operation switch, just fill with warm tap water and add a few drops of your favorite essential oil. High quality construction and unique design. Package Contents: 1 x Aroma Diffuser 1 x Wall Charger 1 x User Manual. Any product you return must be in the same condition you received it and in the original packaging. We usually respond within 24 hours. Thank you for shopping at our store. 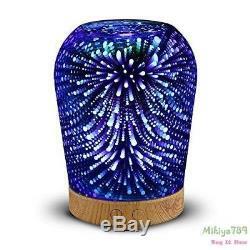 The item "16 Color Changing Starburst LED Essential Oil Diffuser Ultrasonic Cool Mist 3D" is in sale since Sunday, January 14, 2018. This item is in the category "Home & Garden\Home Décor\Home Fragrances\Essential Oils & Diffusers". The seller is "mikiya789" and is located in Multiple Locations. This item can be shipped to United States, Canada, Romania, Slovakia, Bulgaria, Czech republic, Finland, Hungary, Latvia, Malta, Estonia, Australia, Portugal, Cyprus, Slovenia, Japan, China, Sweden, South Korea, Taiwan, South africa, Belgium, France, Hong Kong, Ireland, Netherlands, Poland, Spain, Germany, Austria, Mexico, New Zealand, Switzerland, Norway, Saudi arabia, Ukraine, United arab emirates, Qatar, Kuwait, Bahrain, Malaysia.